Have you ever given yourself a retreat — time out from obligations, time to be nurtured and to reconnect with yourself? If so, you may imagine or hope that the retreat will be peaceful, with no disruptions. But this may not be the case. 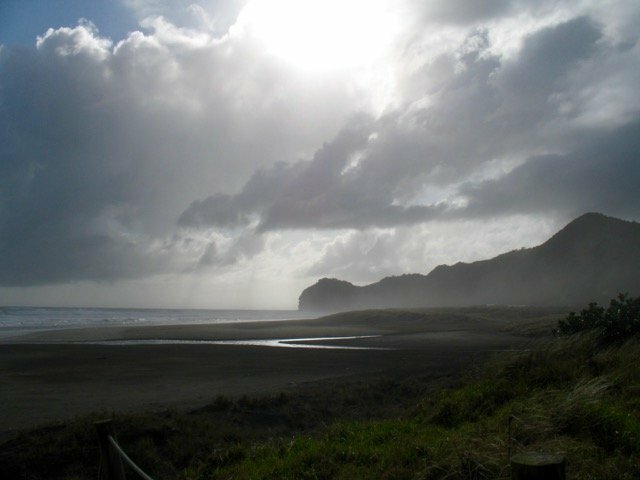 I began writing this post to you from the wild west coast beach where I was taking a retreat. To my surprise, I walked right into a storm. As you can see from the photo above, the storm robbed land and sky of all colour. At night the sea rolled with a rumbly roar while the wind, at a higher pitch, whined like the scraping of silk or whirled like the breath of a giant blowing down a long tube. I could hear it tearing at the tree tops while rain and sometimes hail lashed the walls and windows of my chalet. Yet, amidst all this fury from the elements, I felt still and at peace. Have you ever experienced this — peace in the eye of the storm, or exhilaration even? Turbulence and mayhem raged around me, but were not of me. 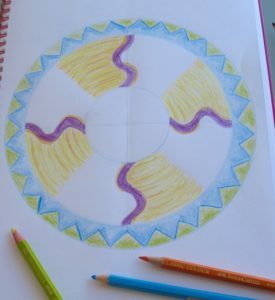 I picked up my coloured pencils and began to draw a mandala. I had entered the witness state, recognised in many spiritual traditions: a state where you watch the drama rather than joining it. Sometimes you have to work very consciously to release attachments or distractions and enter the witness state. At other times it arrives spontaneously as an unexpected gift. This is where true retreat lies: in that space of infinite freedom within. Drama loves to draw more and more actors on to its stage — especially you! I often talk to people who feel bombarded by the dramas of others. Some of these people get caught up in trying to solve and fix. They charge in like fire-fighters trying to extinguish a fire that will quickly flare up again: here, there, everywhere. 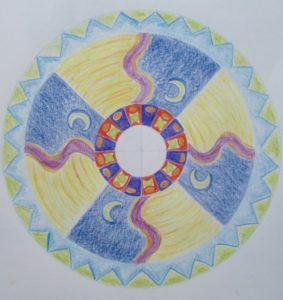 Retreat happens on the inside, and can take place at any moment when you are able to disengage from the drama, to stop still and focus on the breath. Sometimes this feels too hard. Quite apart from your personal life, the world stage is full of drama and frightening events. When life has become too overwhelming, retreat may also need the support of physical removal, time in nature, or a change of surroundings. We all need to find a place of safety, from which we can contact the still place inside. From this stillness you can come into a sense of being held by something greater. In such a place you can give over having to fix, control or even understand. You can let yourself be lovingly held as you return to equilibrium, groundedness and security. Then your own personal resources such as wisdom, strength, or resilience become available once more. These resources shine into the dark places like sunlight blessing the earth after a storm. It is as if birdsong fills the air. Savagery settles, calm returns, and balance is restored as you access what is good, loving and trustworthy. Holding the knowledge of both hate and love, danger and safety, grimness and laughter, you pick up a hoe and till the earth, preparing to sow a new crop for the coming season. Retreat is a form of pause—it is a time apart in solitude, a precious space in which we can see our world in a different light. Would you like to take a personal retreat in your own home? It’s not too late for The Winter Attunement, a one-hour home ritual that will take you into a replenishing connection with your own self. It can be profoundly satisfying to take a dive within, to align with the season and to discover the gift of awareness that awaits you at the end of winter. Hi Hilary, how wonderful to be close to the changing sounds of the sea. I’m now thinking of when the next retreat might be; it was so replenishing. Hi Juliette, wow I truly love reading your words. They help me to relax. I can feel a real sense of calm and inner peace as I run my eyes over your verses. Thank you for helping me find my inner stillness. I am now retired from my consuming teaching career and with prayer and time, I have found my personal stillness. I feel that I am lovingly being held by my God and family as I return to tilling my garden and hearing bird chorus. A true richness that warms my soul. Ka nui te mihi, ka nui te aroha mahana ki a koe e hoa. Adrienne, I’m so happy that my words have brought you a sense of calm and inner peace. How wonderful that retirement is bringing you into such stillness, and that you are so lovingly held. Arohanui, and thank you. Nameste ….peace be with you. Hi Juliet. How wonderful to read your writings on taking a retreat. I feel like I’ve just experienced a mini retreat whilst reading it whilst having some space in my working day. Thank you ! Oh, that’s nice Chris. Thank you. Oh, Juliet! Your images—the picture and words—sound absolutely fantastic. I love storms…and stormy seas…and spaces full of trees, water, sky and solitude. I also so appreciate your teaching on witnessing drama rather than joining in. I find it fairly easy to disengage from others’ dramas…but my own? Not so much. Definitely a place of ongoing, much needed practice. Your call to practice this—and to go on retreat—came at the perfect time. I finished teaching summer term today, though I do give finals next week. A private retreat at a nearby ashram awaits in my near future…and I’m going to explore other places of internal retreat this weekend. Thank you for the added inspiration and nudge. 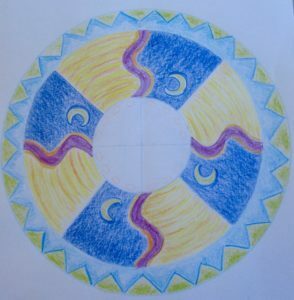 Dana, how wonderful that you drawn to going on retreat too, and that you feel inspired to explore internal retreat this weekend. I am amazed at how deep the replenishment has been for me, and how usefully the retreat is supporting the establishment of some new habits of separating work and home. We seem to share an appreciation of wild nature! Thank you for your appreciations. Stunning, as ever. I like the way you share the process of building and development of a spiritual concept, a spiritual practice…. What a soothing post this was, Juliet. I have had a few times of this stillness within lately, just yesterday, with oppressive heat, clouds coming in and then the sudden blast of the storm. I just sat and listened, watching the rain pelt the skylights. Thank you for this post. Thank you. I’m so glad you found it soothing Penny. What a relief that rain must have been after the oppressive heat, and how lovely you could just sit, listen and watch. Thank you.